For those who like classic and traditional style and design then the titanium milgrain hoop earrings are the choice to make. 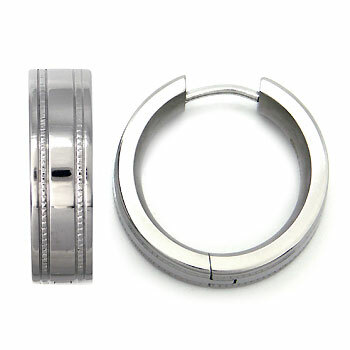 The 20 millimeter diameter earrings are made with grey color high polish titanium, and is 5 millimeters wide. The earrings are featured with milgrain stripes on the top surface given the earrings a very elegant look and feel. Our titanium milgrain hoop earrings are 100% hypoallergenic ensuring that there will not be any skin reactions or discoloration when wearing the hoop earrings. One of the best features of titanium earrings is that they are made from one of the strongest metals available within the jewelry industry. This means that the earrings will withstand normal wear and tear when worn for work, play, or a quiet night of dinner and a movie at home. Don't forget our titanium earrings make a perfect gift to mark any occasion and are perfect for any budget. Something simple, I will buy again. The customer service is excellant and the earrings are extremely well made. These earrings have two very ironic aspects. On one side , when i am wearing them, all my friends notice it. On the other side, when i am wearing them, you will not notice them due to the extremely light weight.